Some times the most simple food are the yummiest to eat. 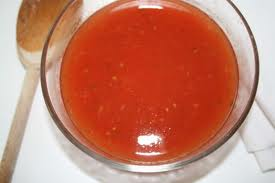 In a deep pot cook the tomatoes in 2 c water and 1 tsp chilli powder for 15 min. When the tomatoes are cooked and soft remove from heat. In a blender blend the tomatoes and strain it out (to remove the skins & seeds). Add 1 c water, sugar and salt then put it back on the stove to boil . Heat the oil and make a vagar of garlic and red chilli. Once they are golden pour it over the tomatoes, bring to the boil once again remove from heat and serve hot with boiled rice. * the end product looks like clear tomato soup.